Animation is starting to slow down a little for me in the last days (if animation is cranked this close to the end then you’ve got problems). So other than a tweak or two here and there, there isn’t much for an animator to do. So yesterday Kjartan made me this little guy. 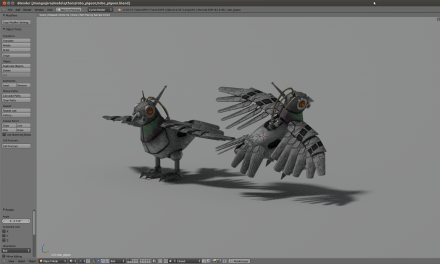 With a quick rig and flap cycle, I’m spending the last hours pigeon’ing any scene I can. Sticking him perched in a tower somewhere in the background, or flying past in the distance just to add a little touch of movement and, eh-hem… life. Yesterday I spent the afternoon seeing if i could get some facegrabbing done (as seen in the screengrab from yesterday). It involved my first try at tracking for the hand which gave me a placement for the robohand and my first try at masking with parenting mask point to tracking markers (very useful for when he talks). Then with a nice backplate and alot of scrubbing, i hand animated the hand and fingers to match the hand and fingers of our lovely actress. I let it render overnight but it didnt bring the background with it, so i set it to go locally this morning (with v.low samples so it would be quick) to get something to show. Looking like i’ll need to animate the back finger, but overall its looking promising**! **I did nothing for lights and comp work (save layering), its all about the movement! At some point we’re going to be switching between the live footage and some holographic representations of the scene. So nice and quickly, using the footage as a background, I animated our old holo blockheads to match the acting as well as needed. As the actors didn’t really move from the spot and and the camera was (mostly) static, it was nice and easy, and I didn’t need any help from the tracking software. A little later Andy will work his magic and make the characters look awesome and holographicy. This is the same as the OpenGL clip i posted last week, just rendered. Again, this was just a test, in no way is this movement the defined style of movement for the Quadbot. The detail in the Quadbot is starting to get a little crazy. With each step up in the model’s detail, the rigging has to be matched. 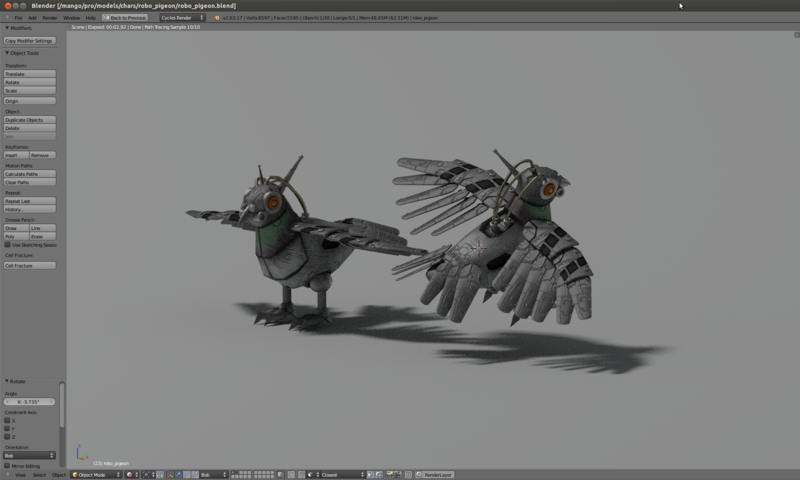 With the rig getting up towards almost 800 bones, its starting to show, and the model isn’t even finished yet. I also set myself a challenge of trying to keep away from major mesh deformation (apart from the pipes). There isn’t a single Armature modifier on this yet.